Welcome to the Diablo Symphony Orchestra’s 55th season! Our opening concert centers on two composers inspired by Shakespeare’s timeless love story. 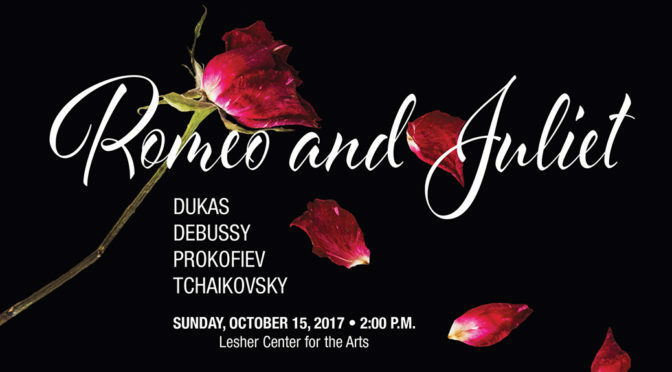 Separated by less than 70 years, these compositions imagine the famous tragedy in wildly different ways, from the unearthly and fierce beauty of Prokofiev’s ballet score to the lush romanticism and high drama of Tchaikovsky’s tone poem. The orchestra will be led by guest conductor Brad Hogarth, and will also feature works by Dukas and Debussy. At the age of 30, Brad Hogarth has performed extensively throughout North America, Europe and Japan. Equally comfortable on stage, on the podium, and in the classroom, he is the Assistant Professor of Wind Ensemble and Conducting at San Francisco State University, the music director and conductor of the Contra Costa Wind Symphony, while maintaining a busy performance schedule as a trumpeter. Since moving to Bay Area, he has performed with the San Francisco Symphony, San Francisco Opera, SF Chamber Orchestra, SF Contemporary Music Players, Eco Ensemble, Bay Brass, Fresno Philharmonic Orchestra, California Symphony, Modesto Symphony, Monterey Symphony Orchestra, Oakland East Bay Symphony, Marin Symphony, and Symphony Napa Valley. Sergei Prokofiev (1891-1953) completed his full-length Romeo and Juliet ballet score in 1935, but the initial collaborations with the Kirov and Bolshoi Ballets fell through, in part due to a controversial "happy ending". Prokofiev therefore extracted from the score two orchestral suites which were first performed in 1936 and 1937. The full ballet finally reached the stage in 1938. It has subsequently become one of the most popular ballets in the repertoire, and one of Prokofiev’s most successful compositions. Pyotr Ilyich Tchaikovsky (1840-1893) composed his symphonic tone poem Romeo and Juliet after a suggestion from the composer Mily Balakirev. Instead of directly portraying the action in Shakespeare’s play, the music instead suggests contrasting characters and moods, including the calm Friar Laurence, the violent feud of the Montagues and the Capulets, and the love between Romeo and Juliet themselves. The work was premiered in Moscow in 1870 and subsequently revised, reaching its final form in 1880.